The elegance and the durability of shoes depend a lot on the quality of the materials used. Paraboot pays the greatest attention to the selection of the best leathers for its uppers, the lining, the insoles and the outsoles. All elements require different qualities, but they all are selected with the same exactingness. Suppleness, resistance, appearence… The leathers are selected in terms of their "main", the touch of the leather, and the desired effect. The most noble leather is calfskin leather. It's used to manufacture the upper of the shoe, called "the tige". 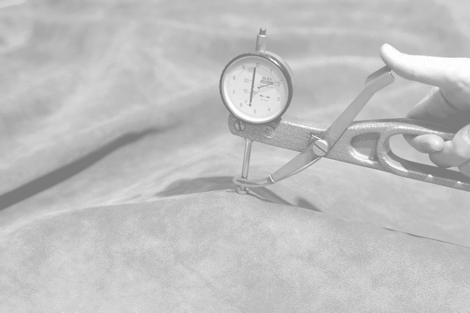 The final quality of the shoe depends on how the different pieces of leather that compose the upper, have been cut. The art of the cutter is to avoid flaws in the skin. It's key that he follows the direction of the stretches. We say the cutter "reads" the skin. Everything is done by eye and touch. Every single skin used is natural (no synthetic topcoat is applied, in order to hide flaws). That's the reason why, every now and then, slight wrinkels or veins are visible and that two pairs are never 100% identical. Your Paraboot shoes are unique. The choice of leather depends on the use for which the shoe is intended. For the more formal models, we favor transparency and fineness of the grain, like box-calf. For our models more "outdoor" with rubber sole, we favor leathers with a high resistance and a less sleek aspect. Suede, grained leather, nubuck, patent leather, cordovan… So many different materials and ways to treat the upper, that allow varied collections. The quality of meticulously selected skins in tanneries plays a key role in the comfort, durability and aesthetics of Paraboot shoes. We have been working closely tanners for several generations, maintaining a special relationship with these companies. Our suppliers are among the most prestigious tanneries in France, and supply all the big names in footwear and luxury leather goods. 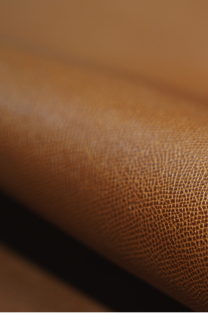 77% of our raw materials come from France; with the exception of American Cordovan Leather. The other leathers used are of European origin. They all comply with the requirements of the various European legislations in force. Our welts have to be supple, resistant and non-deforming at the same time. They are cut out of full grain croupon, vegetable tanned, respecting very precise criteria as to thickness and width. The welts allow the upper and the sole to connect. The welt can be flat, sleek, smooth, notched, bicolour… detail that lends various style options to your shoes. Our intermediary soles, heels and outer soles are still made with the same blends and volcanization processes, that were used for original Paraboot shoes. Our blends are French and are volcanized on our customized presses, in the factory of Saint Jean de Moirans. We remain faithful to traditional hand-sewn techniques.